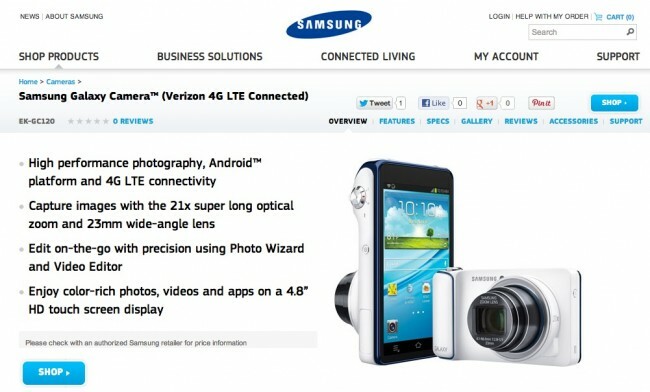 Last week, we saw a Galaxy Camera variant cruise through the FCC with a 4G LTE radio inside, one that was ready to jump on Verizon’s 4G LTE network. Neither Big Red nor Samsung would confirm that the device was on the way, but they no longer need to as an official product page on Samsung’s site is now live for the device. We don’t have a price, but we can’t imagine it will run for more than the $499 price of the HSPA+ version. If it is more expensive, they that would be a massive mistake. In our review of the device, we talked about the convenience that the camera brings with the ability to share photos from anywhere, however, the price is too steep for a camera that won’t “Wow!” you as a camera.